Annuals, 100-300 cm. Stems erect, usually hispid. 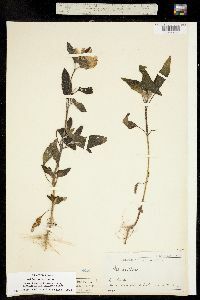 Leaves mostly cauline; mostly alternate; petioles 2-20 cm; blades lance-ovate to ovate, 10-40 × 5-40 cm, bases cuneate to subcordate or cordate, margins serrate, abaxial faces usually ± hispid, sometimes gland-dotted . Heads 1-9. Peduncles 2-20 cm. Involucres hemispheric or broader, 15-40(-200+) mm diam. Phyllaries 20-30(-100+), ovate to lance-ovate, 13-25 × (3-)5-8 mm, (margins usually ciliate) apices abruptly narrowed, long-acuminate, abaxial faces usually hirsute to hispid, rarely glabrate or glabrous, usually gland-dotted. 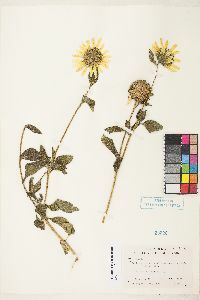 Paleae 9-11 mm, 3-toothed (middle teeth long-acuminate, glabrous or hispid). Ray florets (13-)17-30(-100+); laminae 25-50 mm. 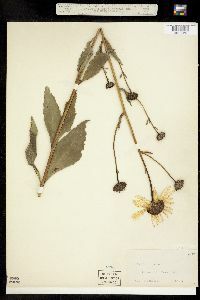 Disc florets 150+(-1000+); corollas 5-8 mm (throats ± bulbous at bases), lobes usually reddish, sometimes yellow ; anthers brownish to black, appendages yellow or dark (style branches yellow) . Cypselae (3-)4-5(-15) mm, glabrate ; pappi of 2 lanceolate scales 2-3.5 mm plus 0-4 obtuse scales 0.5-1 mm. 2n = 34. Flowering summer-fall. Open areas; 0-3000 m; St. Pierre and Miquelon; Alta., B.C., Man., N.B., N.W.T., N.S., Ont ., P.E.I., Que., Sask. ; Ala., Ariz., Ark., Calif., Colo., Conn., Del., D.C., Fla., Ga., Idaho, Ill., Ind., Iowa, Kans., Ky., La., Maine, Md., Mass., Mich., Minn., Miss., Mo., Mont., Nebr., Nev., N.H., N.J., N.Mex., N.Y., N.C., N.Dak., Ohio, Okla., Oreg., Pa., R.I., S.C., S.Dak., Tenn., Tex., Utah, Vt., Va., Wash., W.Va., Wis., Wyo. ; Mexico; intoduced nearly worldwide. 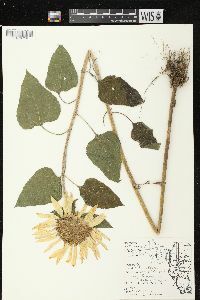 Helianthus annuus is widely distributed, including weedy, cultivated, and escaped plants. It is the only native North American species to become a major agronomic crop. Despite its considerable variability, attempts have failed to produce a widely adopted infraspecific system of classification. Forms with red-colored ray laminae, known from cultivation and occasionally seen escaped, trace their ancestry to a single original mutant plant. 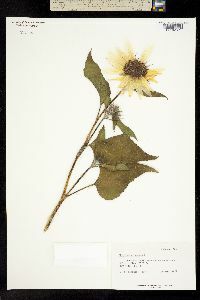 It hybridizes with many of the other annual species. 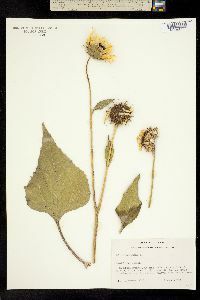 This species has been cultivated more or less for many years in all parts of the state and there are reports of its escape from all parts of the state. I doubt whether it is a native of the state although in 1922 I found it to be a common weed along a sandy roadside and in an adjoining sandy, fallow field about 2 miles northeast of Jacksonville, Vermillion County. 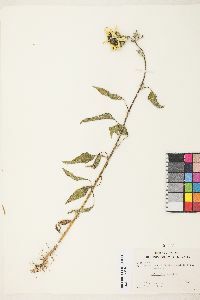 The plants were comparatively small, mostly from four to six feet high. Phinney in 1883 reported it as common in the prairies in Delaware County but most authors report it as an escape.